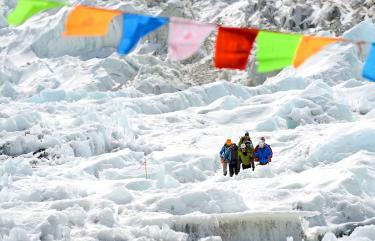 Trekking outfits are taking climbers to Everest on choppers at below cost only to whisk them back afterward to claim huge payouts from insurance firms. Dodgy operators are scamming tens of thousands of US dollars from insurance companies by making multiple claims for a single chopper ride or pushing trekkers to accept airlifts for minor illnesses, an investigation has revealed. In other cases, trekking guides, promised commission if they get tourists to return by chopper, are offering helicopter rides to tired hikers as a quick way home, but billing them as rescues to insurance companies. The practice is so rampant helicopter pilots are reporting “rescuing” tourists who appear in perfectly fine health. “It’s a racket that’s tantamount to fraud, and it’s happening on a large scale throughout Nepal,” said Jonathan Bancroft of UK-based Traveller Assist, which carries out medical evacuations in Nepal on behalf of global travel insurance companies. Trekking outfits stand to make more in kickbacks from evacuating a hiker by helicopter than the cost of the trek itself, contributing to an alarming rise in rescues from Nepal’s biggest tourist attraction: the fabled Himalayas. Traveller Assist said last year was the most expensive year on record for travel insurance companies covering tourists in Nepal due to a startling number of helicopter rescues — though this year is on track to beat it. There is no centralized dispatch center for helicopter flights in Nepal making it difficult to know precisely how many evacuations are carried out. However, over the past six years the skies of the Everest region have turned into a helicopter highway, with a six-fold increase in the number of choppers in the air, each logging more than 1,000 flying hours per year, according to industry data. “We used to see maybe one helicopter in two or three days. Now we are seeing 10 or so in a day,” said Thanishwar Bhandari, who works at a small clinic in the Everest region. Meanwhile, one foreign pilot, who requested anonymity, said he rescued trekkers on a near daily basis in April and May, peak trekking season. “I think I took three people the whole season who appeared genuinely ill,” he told reporters. Australian trekker Jessica Reeves was urged by her guide to be evacuated by helicopter from near Everest base camp in October last year when she complained of a common cold. Reeves said 10 hikers in her group ended up returning to Kathmandu on three helicopters, but were instructed to say they were alone on the flight back. She said the company, Himalayan Social Journey, billed each of the tourists’ insurance providers for the whole flight — pocketing about US$35,000 in the process. The cost of the 14-day trek to Everest base camp varies wildly between the outfits, but many offer the tour for less than US$1,000, below cost price, according to multiple industry sources. “The industry thrives on these unnecessary rescues,” said Suraj Paudyal, who coordinates helicopter rescues for Mediciti Hospital in Kathmandu. For doctors working in the high-altitude Everest region, the increased availability of helicopters does provide reassurance that critical patients can be airlifted from remote locations to better-equipped hospitals below.